Andrew Bostom gleans the buried truth deep in an unclassified May 2011 internal Pentagon "Red Team" report on murder "inside the wire": It turns out that these Pentagon analysts actually lifted the official blinders a crack to note clash of civilizations as a driver behind the constant violent assaults by Afghan security forces on US and other Western forces, and even suggested US troops be instructed in an "objective and comprehensive assessment of the totalitarian nature of the extreme theology practiced among the Afghans." Of course, that was only suggestion #40 out of 58, so, so much for the Red Team's powers of priority-analysis. 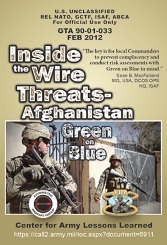 Clearly, the team's suggestion wasn't taken as a February 2012 pocket reference guide (pictured above), "Inside the Wire Threats -- Afghanistan Green on Blue," demonstrates. The complete handbook on which this so-called smartcard is based inexplicably remains classified, but the gist is clear. 1) US troops are to walk on eggs and refrain from saying or doing anything that might set off their armed, "hair-trigger moderate," Afghan counterparts: "Avoid public rebukes," troops are told. "Counsel in private jointly with ANSF chain of command" (directions, surely, any self-respecting drill sergeant would roar at). 2) Worse, US troops are ordered to assume the age-old role of the dhimmis, those wretched, self-censoring non-Muslims repressed and stunted by Islamic law: "Respect Islam, Koran or a mosque; Afghan women, elders and children. Avoid arrogance; i.e., belief that ISAF culture is superior to Afghan culture." This, pure and simple, is code for submission to Islam's culture and tenets, which, if the truth were taught in accordance with the Red Team's sensible recommendation #40, directly conflict with and contradict "ISAF culture" -- i.e., Judeo-Christian-humanist principles. The unspeakable fact is, "respecting Islam" and "avoiding arrogance" are impossible to do without surrendering these same Western principles. As much as Islam's command to Muslims to slay the infidel, this fact, as the Red Team report perhaps inadvertently reveals, is probably at the heart of at least some of the "green-on-blue" attacks that are reported to have followed an "argument." US soldiers reported that they had observed many cases of child abuse and neglect that infuriated them and alienated them from the civilian populace. They made it very clear that they wanted nothing to do with people who treat children so cruelly. Similarly, US soldiers...mentioned the poor treatment and virtual slavery of Women in Afghan society, and how they found such practices repugnant. They found it unpalatable to befriend other men who had such primitive beliefs; the cultural gulf was too wide. They were repulsed by the abuse and neglect they observed in how children are treated in Afghan society. US soldiers largely reported that they did not care for Afghan civilians due to these factors as well as their suspected sympathies for the insurgents. And so they shouldn't. And woe to us if they, or we all of us, ever do. Diana West is a journalist and columnist whose writing appears in several high profile outlets. Her website is at www.DianaWest.net. This article appeared August 30, 2012 in Family Security Matters (http://www.familysecuritymatters.org/publications/detail/ dying-over-the-truth-murder-inside-the-wire).